Godey’s Lady’s Book magazine was intended to entertain, inform and educate the women of America. In addition to extensive fashion descriptions and plates, the early issues included biographical sketches, articles about mineralogy, handcrafts, female costume, the dance, equestrienne procedures, health and hygiene, recipes and remedies and the like. 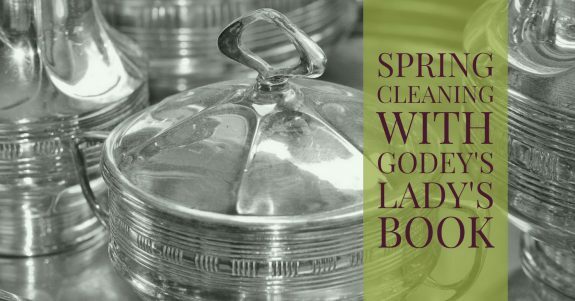 These tips on the cleaning and maintenance of the home appeared in an 1855 issue of Godey’s Lady’s Book. TO CLEAN FURNITURE— An excellent method of cleaning mahogany furniture, which is not French polished, is this: Put into half a pint of linseed oil, a small quantity of alkanet-root, and a little rose-pink. Let this mixture stand for three days in a vessel that will allow stirring it, and stir it three or four times each day, and then put it into a bottle for use. If the furniture is very dirty, wash it with soap and warm water, and then rub with vinegar, and before the vinegar is thoroughly dried off, lay on, with a bit of old flannel or rag a covering of the mixture, and continue rubbing until the oil is well soaked in. Then rub with a clean soft cloth until it is quite dry and bright. If the furniture is not very dirty, the vinegar may be used without the soap and water. TO CLEAN FEATHERS — Take for every gallon of clear water one pound of fresh-made quicklime; mix them well together, and let it stand twenty-four hours, then pour off the clear liquid. Put the feathers into a tub, and pour over them enough lime-water to thoroughly cover them. Stir them round and round, briskly and rapidly, for a few minutes, and leave them to soak for three days. Then remove them from the lime-water, and thoroughly rinse in clean water, and spread them to dry. They will dry better where a drought of air can reach them; and should be spread very thinly, and frequently moved, until they are quite dry. This plan may be used, either for new feathers or for such as have become heavy or impure by age or use. TO CLEAN DECANTERS — Cut some raw potatoes in pieces, put them in the bottle with a little cold water, rinse them, and they will look very clean. TO RENOVATE BLACK SILK — Slice some uncooked potatoes, pour boiling water on them; when cold, sponge the right side of the silk with it, and iron on the wrong. TO CLEAN CARPETS — After all the dust is taken out, tack your carpets down to the floor. Then mix half a pint of bullock’s gall with two gallons of soft water; scrub it well with soap and this gall-mixture; let it remain till dry, it will then look like new. Be careful your brush be not too hard. STRAW MATTING — Straw matting should be cleaned with a large coarse cloth dipped in salt and water, and carefully wiped dry. The salt prevents the matting from turning yellow.